New Media society opens the doors of its new project room for the 1st time, on Friday Nov. 6, 2015, from 3 to 8 pm. 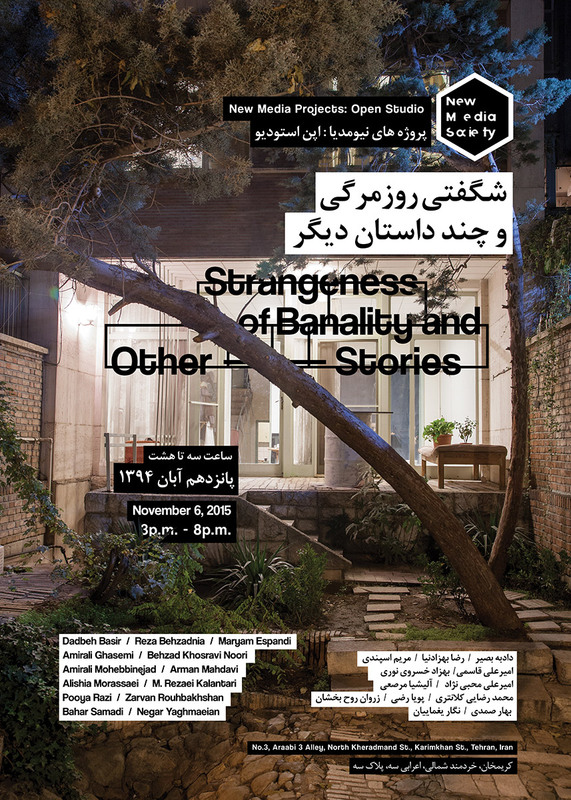 New Media project room will host “Strangeness of banality and other stories” curated by Zarvan Rouhbakhshan, & Amirali Ghasemi with contribution ranging from Video and short films to artist books and photographs. Bahar Samadi, Negar Yaghmaeian, Zarvan Rouhbakhshan,Pooya Razi, M. Rezaei Kalantari, Alishia Morassaei, Arman Mahdavi, Amirali Mohebbinejad, Behzad Khosravi Noori, Amirali Ghasemi, Maryam Espandi,Reza Behzadnia & Dadbeh Bassir. No. 3, Araabi 3 Alley, North Kheradmand st., Karimkhan Ave.